Gordon Goudie starred as Mazars Grange defeated Stuart&Stuart Penicuik to lift the Murgitroyd Masterton Trophy at Grange Loan last night. 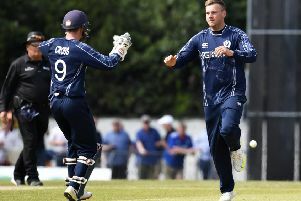 Penicuik batted first in the Twenty20 final, but were put under pressure by the Grange bowlers from the outset. Goudie, the Scotland cap, was the main man for the Edinburgh team. His accuracy was too much for the Midlothian players and he took 4-8 from his four overs including two maidens. He was well backed up by skipper Andrew Brock whose spin brought him two wickets from the pavilion end. For the underdogs, captain Chris Ashforth battled manfully for 22 off 44 balls and Matthew Foulds made 13. In the end they made 65-9 from their 20 overs. In Grange’s reply, Penicuik knew they needed early wickets and they got off to a great start. Heynrych Nel took two wickets in the first over, having both Nick Farrar and Goudie caught. That put Grange on 4-2 and when Preston Mommsen was out in the fourth over with the score on 17 Penicuik had their tails up. However, Ryan Flannigan (23 not out) and Neil McCallum (27 not out) settled things down and in the end Grange won by seven wickets.